Pinky and Rex are excited. It's pumpkin-picking weekend with Pinky's Grandma and Grandpa. Pinky's sister and cousin are coming along, too. At Meadowbrook Farm, they'll pick the perfect pumpkin. Then they'll take it to Grandma and Grandpa's and carve it for Halloween. But when Pinky's cousin arrives, she doesn't say hello to Rex. Instead she does her best to keep Rex out of the fun. Rex feels hurt. When a terrible thing happens, she feels even worse. How can she and Pinky be best friends again? When he was growing up, author James Howe had a best friend who was a lot like Rex, and he based Pinky on his own childhood. 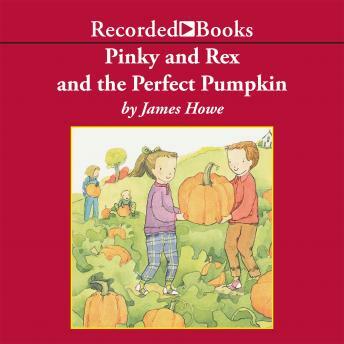 His Pinky and Rex series is a favorite of young readers who are beginning to enjoy chapter books on their own. Narrator Christina Moore has been highly praised for her performance of these wonderful stories.